This is the main title of a new book by Rory Pilossof from the University of Pretoria and published by Weaver Press in Zimbabwe. 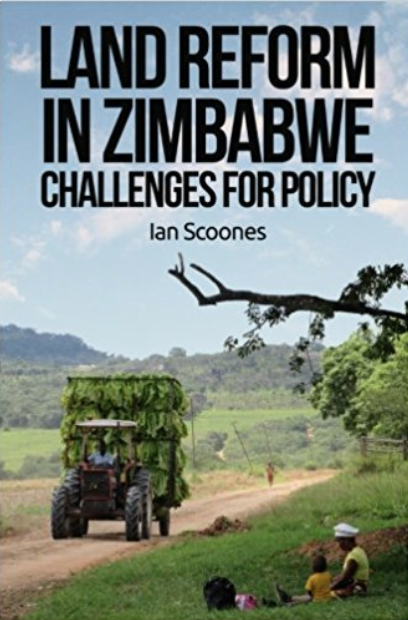 The book documents the voices of white farmers in Zimbabwe through an analysis of the contributions to the CFU’s magazine, The Farmer, especially in the period after the land invasions, a reading of the now burgeoning post 2000 literature by white Zimbabweans, and through interviews with members of the breakaway Justice for Agriculture (JAG) group. In addition to the brilliant title (although not the only use it seems), it is a fascinating read giving a much needed account of this period from the perspective of those who lost land. The events that unfolded from 2000 with the mass invasion of farms, including outbreaks of sometimes extreme violence in places, are certainly very real. The tales told are harrowing and convincing: somehow more so than the journalistic accounts of Peter Godwin and co. They mix the mundane with the dramatic, and are set in life stories that are very peculiarly Zimbabwean. The appendix of profiles of those interviewed (mostly from Mashonaland) is particularly enlightening. Yet the unreal and strange is also there. These testimonies are from the twenty-first century, but with many views and perspectives belonging to the nineteenth. As Pilossof recounts, farmers who were willing to speak (obviously a selective sample) were so caught up in the traumatic events that their prejudices were plain to see, and not hidden from an interviewer who, as someone with white skin, was assumed to be sympathetic and of similar views. Strange is perhaps too calm an epithet: to many outside the narrow, isolated social circles of white rural Zimbabwe, such views are shocking; what Pilossof calls ‘condescending paternalism’ and ‘racist ramblings’ in one book he reviews. Together these insights expose of course the extraordinary social and political separation that many in the white farming community got caught in, even 20 years after Independence. The cultural mores and political biases, and the racial tinge to everything are well documented in David Hughes’ book, with its analysis of landscape, conservation and farming. But somehow this book is more direct. Pilosoff tries to be balanced, and clearly he is affected by many of the stories told, but he also is forced to comment on what he hears. The pervasive ‘white myopia’, as Pilossof terms it, was upheld by a series of myths. These “served the important function of allowing white farmers to live at ease with the scale of their land holdings, and to believe that they had done no wrong by buying into a system that so obviously segregated black from white”. This was bolstered by the view that farmers were apolitical, and that all they did was farm, despite for many representing the unfinished business of the liberation war. The book identifies a number of ‘myths’ of white farming: how farmers tirelessly struggled to tame an empty and unforgiving bush, how they had equally to control and discipline their workers who were lazy and deceitful, and how the productivity of white farming was the result of such disciplined hard work and investment. As he notes, no mention is made in the accounts of course of the massive government subsidies that kept most white farming afloat, nor the terrible conditions most farm labour suffered. The accounts offer glimpses into a worldview overshadowed by patronising superiority. People emphasised how they loved and cared for their special servants and farm managers, yet despised and feared their land hungry neighbours, deemed to be ‘gooks’ and ‘terrs’. There is no narrative of belonging or of equality, just one struck through with racial superiority. It is no wonder that most found the land reform utterly surprising and wholly reprehensible. It ran against all things they upheld. Despite being hard working and sometimes quite successful farmers, many simply did not realise that things had to change, and this stubborn resistance to the ‘wind of change’ (40 years after MacMillan gave the famous speech in the South African parliament) is witness to the extraordinarily narrow outlook that many held. “While many claimed to have changed their identity, to be Zimbabwean rather than Rhodesian, and to be ‘white Africans’, this is tempered by their use of the word ‘African’ to always and only to refer to blacks. As such, white farmers in Zimbabwe are ‘orphans of empire’, unable to progress past this state of being thus ‘become’ Zimbabwean”. In some ways the book could be critiqued as unbalanced. Pilossof found it difficult to gain access to information, and many people would not speak, so charged was the atmosphere in the mid 2000s. His interviews are with an extreme group – JAG – which many would say was not part of the mainstream, although it was plentifully supported by foreign donors. He also interviewed people in the heart of Mashonaland where the land invasions were most contested, and where violence was most prominent. Also, after 2000 The Farmer was in its dying days, when it was most shrill in its criticisms of the land reform, rejecting the more conciliatory stances of some within the CFU. He also uses the sometimes bizarre white memoirs and biographies as sources, which many would argue offer particularly odd interpretations of white Zimbabwe. He therefore did not speak to those realists and pragmatists who perhaps saw the land reform as the ‘writing on the wall’, something that was inevitable and that had to be accommodated. He did not discuss with those who did not have an escape route to town, with alternative non-farm businesses, and so did not speak to those who sought compromises and accommodations on their farms. And he did not speak to those few who actually supported land reform, even if not the form it took. This is another dimension of white farmers’ voices that needs to be told, and awaits another book. But such gaps do not undermine the value of the book, as the array of perspectives garnered while showing variation and lack of clear consensus, definitely shows a particular and well recognised discourse. As a documentation of the perhaps inevitable end of an era spawned by a brutal form of settler colonialism it provides a rather sad and telling doorstop to a troubled period. updated, June 2013, thanks to David Moore for spotting an earlier mistake!